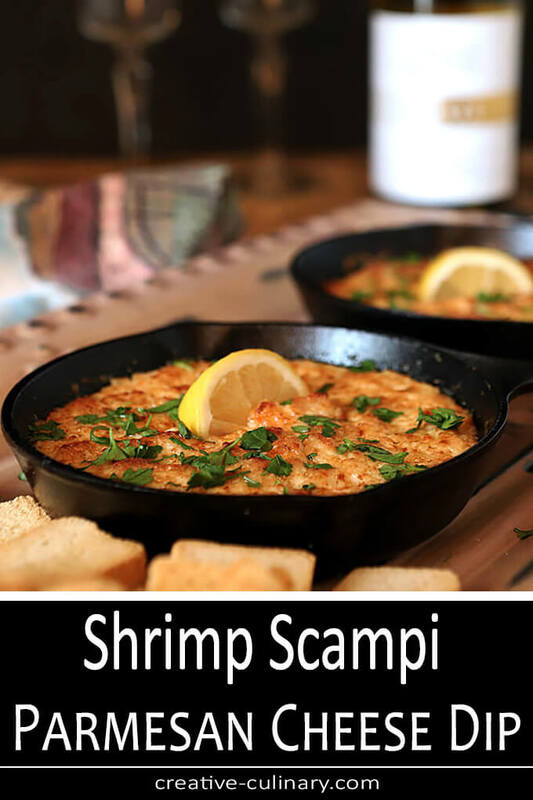 If you love Shrimp Scampi like I do; I know you’ll absolutely swoon over this Shrimp Scampi and Parmesan Cheese Dip which morphs this delicious shrimp dish into an appetizer with the addition of cream cheese, mayo, and sour cream. I’m going to apologize for some things today so bear with me. First and foremost I’m sorry I did not publish this dip before the big game so that you could have made it too. 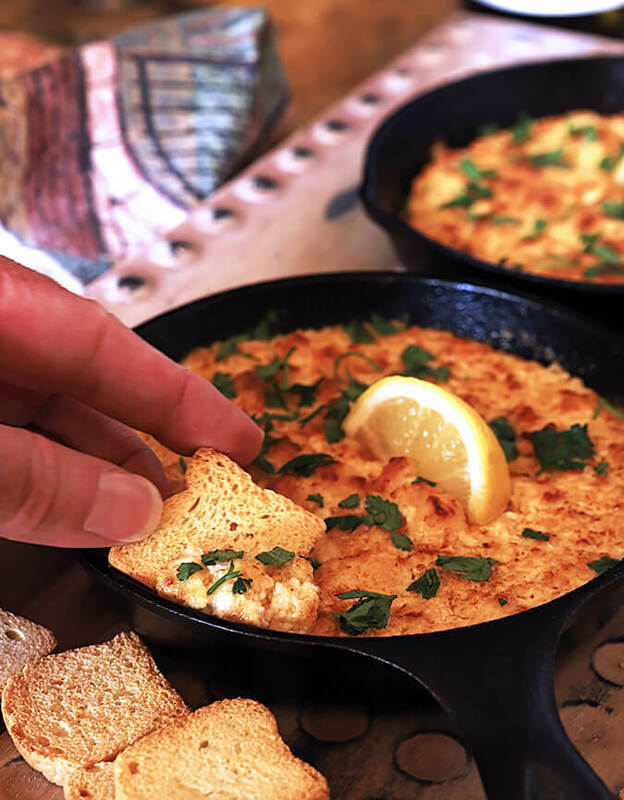 It was one of those unplanned moments of just throwing something together and it wasn’t until I was done that I knew I had to share this Shrimp Scampi and Parmesan Cheese Dip. It’s definitely a celebration dip. Because you sort of need a good excuse and plenty of people to share it. Why? Let’s see…as I told my friends it has fat, fat, fat, fat, and fat…and some shrimp. How could it not be DELICIOUS? If it’s Shrimp Scampi, the shrimp is sauteed in a garlic butter. Then instead of just combining it with cream cheese I decided to break that part down into a combination of cream cheese, mayonnaise, and sour cream. Then lots of Parmesan too. I’m telling you, it was worth every single calorie but I’m most grateful that my friends all loved it too; we each got a couple of toasts with enough to please but not enough to require an entire day at the gym. Whew! My house has become our street’s gathering place for events like the Super Bowl. I have the advantage of no little kids to corral and quite honestly that means my house is always in pretty decent shape and the floors aren’t filled with toys so I can easily do spontaneous. Of course I am also the one who loves to cook so stands to reason I love the excuse of making something new; even if unplanned. And boy was this unplanned. I hadn’t planned to watch the game, just the entertainment. I hadn’t planned to invite neighbors until there was a consensus that the entertainment would be worth it. I hadn’t planned on an appetizer…but, well, it all happened and we had a great time. Shrimp Scampi came to mind, I assessed what I had in the fridge and out came this complete deliciousness. Have I mentioned it was delicious already. Should I come up with something else to describe it? Yummalicious maybe? I shed a tear when the last morsel was gone. It will be done again! By the way? The adorable 6.5″ Mini Cast Iron Pans? So perfect for a warm appetizer; not just their size but they actually retain heat and keep foods warm; I love them! So what else do I have to apologize for? Well, not that I would expect any of my wonderful readers to complain but I’m REALLY struggling with a new camera. I decided to give myself a Christmas gift and upgraded my crop sensor camera to a full frame camera; a Canon 60D. This has been akin to going from driving a small sedan with an automatic transmission to trying once again to get my Dad’s baby, a big old ’55 Chevy, up a hill with a manual transmission when I was but 13 years old. I’m rolling backwards a bit! I have been assured that I will get there but I also realized early on that with a new camera, the lens I’ve been using is seeing things completely differently and my up close and personal shots are just not as satisfactory anymore; it’s a zoom lens and has worked beautifully with my now older camera but this camera needs two things. Me to get better acquainted with it and a macro lens. The irony does not escape me that the rebate credit card I got from my camera purchase has now also gone to Canon for a new 100mm macro lens. Smart guys, very smart! Still, I had one chance to snap some photos and not a whole lot of time at that but this Shrimp Scampi and Parmesan Cheese Dip was too good to pass on. My hips won’t allow me to make it again without another event so we’ll just have to make do with these photos until then. I know I look at them and want more…hope they do the same for you! Preheat oven to 350°F. Lightly grease with butter or nonstick cooking spray either two small or one medium size ramekin or other oven safe dish. Melt the butter in a medium skillet. Add garlic and simmer for 30 seconds; add the shrimp, (See Notes) salt, and pepper and cook over medium heat, stirring occasionally, until the shrimp is pink and the garlic is fragrant (about 4 minutes). In a medium bowl stir together the softened cream cheese, mayonnaise and the sour cream or yogurt and mix until smooth. Add the Parmesan cheese and stir until well combined. Add the shrimp and garlic butter mixture from the pan and the lemon juice and stir everything well. 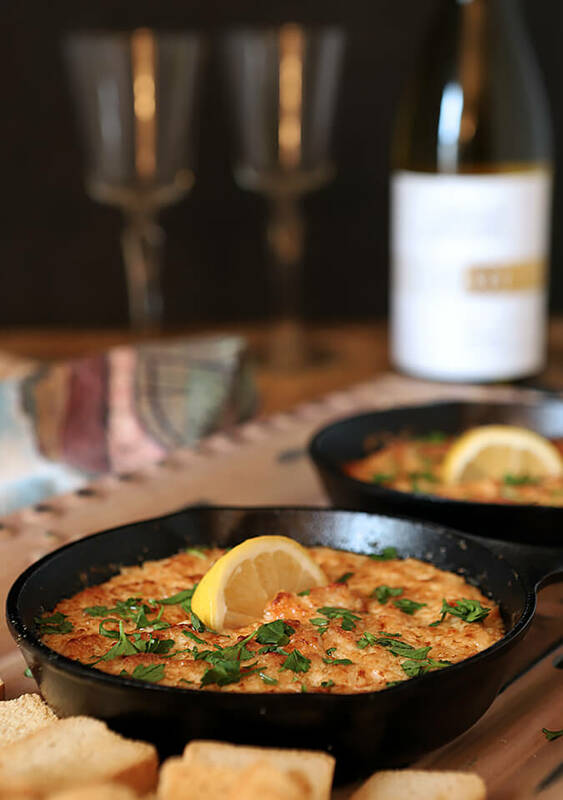 Spoon into the prepared baking dish and place in the oven; bake for 20 minutes until bubbly. Turn on the oven broiler and broil for 1-2 minutes (watch carefully) just until the top is lightly browned. Serve hot with melba toasts, sliced and toasted baguette, or crackers. I had really large shrimp so I cooked them first and then chopped them into 1/4-1/2 inch pieces; I did not want to overcook small pieces so handle yours accordingly. Found this dip to be too salty. Not much shrimp flavor the parmesan taste was greater. Did you use authentic Parmesan cheese? Often the products we can get pre-shredded are a mixture like Parmesano/Reggiano and are saltier than true Parmesan. I hate you were disappointed especially since my guests devoured it and wanted more. The next time I make it I’ll try eliminating the extra salt and see if that makes a difference in the taste to the point that I can remove it from ingredients. Thanks for your feedback. Wow, this looks like dinner! Really creative recipe — and SO FULL of flavor. Sorry you’ve been having problems adjusting to your new camera. I don’t know what focal length you were shooting with your crop camera, but you probably do need to go longer with your lens to get the same “look” in terms of perspective. Only other difference between crop and full frame is the full frame when wide open let’s things past the plane of focus fall out of focus more quickly. But that’s your style anyway (you love those out of focus backgrounds), so that should be a plus with you on your new camera, I’d think. Anyway, this looks great! Thanks so much. It’s definitely a learning curve and yes, you are exactly right; I keep backing up! This particular shoot was a struggle mostly because of time; as I had none. This was such a last minute dish and with guests coming I was pushed a bit; not a good thing with a new camera I’ve not quite mastered. I can absolutely see that the focal plane is different and that’s part of the adjusting. I setup my laptop yesterday after this shoot to be plugged into my camera so I can see the shot itself in a larger frame than the camera viewer; that helps a lot. It’s a struggle but it’s also fun; I love figuring it out!